Vienna Design Week 2010: Austrian designer Rainer Mutsch has created a range of outdoor seating moulded from sheets of fiber cement. The recyclable composite is more normally used in the construction industry, and is made from natural materials including cellulose fibres. Called Dune, the seats comprise loops of the material and can be used as individual pieces or a modular system. Mutsch developed the project with Viennese production company Eternit and presented it at the Verdarium showroom as part of Vienna Design Week earlier this month. When I saw the very first Eternit – machine, I was amazed: 20 metres long, more than 100 years old and by now of course upgraded with high-tech computers, the very heart of the machine is still the cast-metal construction built back in 1905. This impressive device survived 2 world wars and is until today producing a material which is sold worldwide. The history of the material and its technical potential were part of its fascination and at the same time it was a challenge for me to work with a material that it is, due to its roughness and its primary use as building material, not necessarily associated with furniture design in the first place. ergonomics, durability, capability of mass production, release properties, statics, modularity, and eco friendliness, to mention only a few. 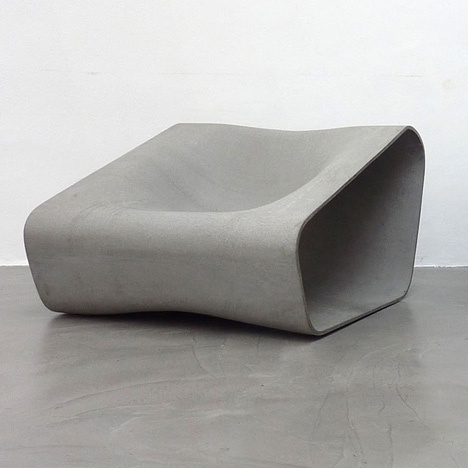 Many prototypes and a lot of research were necessary in order to get the maximum stability out of 3d- deformed fiber cement; eventually, the geometry of the chair supports its stability through its controlled expansion and compression of the material. Dune visualizes the present material-technical maximum parametres of the fibercement material. The result is a highly stable structure with a load-carrying capacity way over the demanded requirement profile for public spaces. With Dune I wanted to tell a story about the materials capabilities, the history of the company and the hand formed production method. The shape of all 5 Dune elements now allows the user to move freely on the objects and to choose an individual seating position according to his or her individual taste. This flexibility guarantees at the one hand maximum comfort for the individual and on the other hand facilitates communication when the elements are arranged in a group. Since Dune has been designed as highly modular and indefinitely expandable system, it fits all spatial situations. The possibility of the integration of plants offers an additional possibility to create shadow and to further customize the space. DUNE will be available from spring 2011. Produced by the company Eternit fiber-cement is a very durable, fully recyclable material consisting of 100% natural materials like cellulose fibers and water. Each Dune element is 3D-molded out of one whole fiber-cement panel (260 x 110cm), the cut-offs are thereby reduced to a minimum.